sampling rate of 1 GS/s. 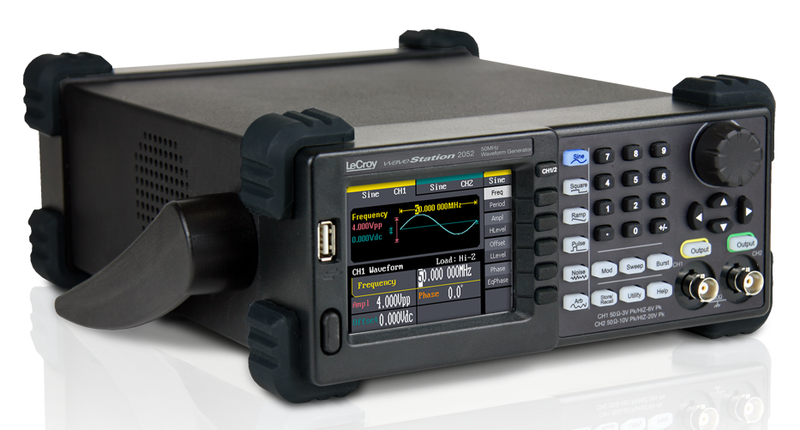 Next to an oscilloscope and perhaps a digital multimeter, a waveform generator is one of the most versatile and useful pieces of test equipment on the bench. Often, a device or circuit under test will require some kind of signal stimuli with which to confirm proper function and/or ferret out faults. 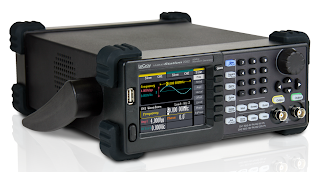 This can run the gamut from a simple swept sine or pulse waveform for purposes of characterizing signal response, to advanced serial-data protocols, and even to the playback of analog signals captured in the real world. A waveform generator is your ticket to creating the required stimuli for your device or circuit under test. There are a myriad of options on the market for instruments of this type, and they fall under two broad categories: function generators and (arbitrary) waveform generators (Figure 1). Function generators are an older category of instrument with a limited range of operation. A function generator will output common standard waveshapes such as a sine wave, square wave, sawtooth wave, pulse output, or triangle wave. If you're looking for high stability and extremely low noise, a function generator may not be the best choice, as they are often based on a simple triangle-wave generator derived from the charging and discharging of a capacitor from a constant current source, producing a linearly ascending or descending voltage ramp. As the voltage reaches its upper/lower limits, the charging and discharging is reversed by a comparator. Varying the current and size of the capacitance yields frequency changes in the output. Some instruments include bells and whistles such as attenuators, various ways of modulating the output, and the ability to repetitively sweep the output frequency over a predetermined range. These older function generators usually top out at around 20 MHz. There are more specialized RF signal generators if you need higher frequencies, but these differ from the garden-variety function generator in that they output only pure or modulated sine waves. When test needs grow beyond relatively simple and standard wave shapes, it's time to move up to a waveform generator (preferably one with arbitrary waveform functionality). An arbitrary waveform generator, or arb for short, isn't limited to a few generic wave shapes. Thanks to true arbitrary waveform creation, arbs can reproduce extremely complex signal sequences with high fidelity and accuracy. The main difference between the two, then, is the ability that an arb provides for the user to precisely define the output(s) of the instruments. Sure, most arbs pack the same standard waveforms as the old function generators, but they go light years beyond that. In an instrument such as Teledyne LeCroy's WaveStation family, you'll find lots of advanced functions, with libraries of basic wave shapes augmented by dozens of arbitrary waveforms (Figure 2). Stacked on top of that are a full complement of modulation schemes, including AM, FM, PM, ASK, PSK, and FSK. Want more variety? How about noise and math functions? Not only that, but multiple units can be synchronized. The flexibility of modern arbs derives from their ability to construct waveforms from point-by-point waveform synthesis. Teledyne LeCroy's arbs are packaged with PC software that provides a graphical interface for quickly modifying waveforms with point-by-point editing, digital filtering, and waveform drawing tools (Figure 3). Waveforms can be precisely tailored to a specific test requirement. There are three primary ways to get a waveform into an arb's memory. One is to define the waveform using the PC software and then download it to the instrument. A second is to use the instrument's front-panel controls to dial in the desired attributes. A third is to export a waveform captured on an oscilloscope to the arb (or vice versa). There are any number of use cases and applications for arbs, such as generation of compliance waveforms for standards-based communication links, creation of combination waveforms from multiple sources (for example, a sine wave coupled with a pulse), generation of noise signals or signals coupled with distortion, and many more. We'd love to hear from readers with descriptions of your own arb test scenarios.